Question: Can we ever move back to a gold standard? See the answer at the end of the blog. Let’s look at the future and see how market conditions impact investment strategies.The factors that are driving the stock market and other investments include: The Federal Reserve and the U.S. Dollar; commodities like oil, gold, metals and crops; and current interest rates. 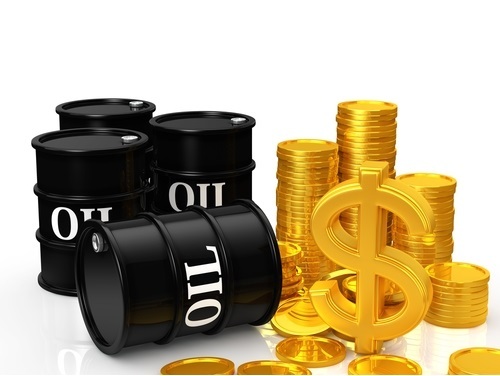 In this blog, we will focus on the gold and commodities. So let’s talk about the supply-side of oil. Geologist M. King Hubbert famously (and so far) correctly predicted in 1956 that U.S. domestic oil production in the lower 48 states would peak around 1970 and begin to decline. 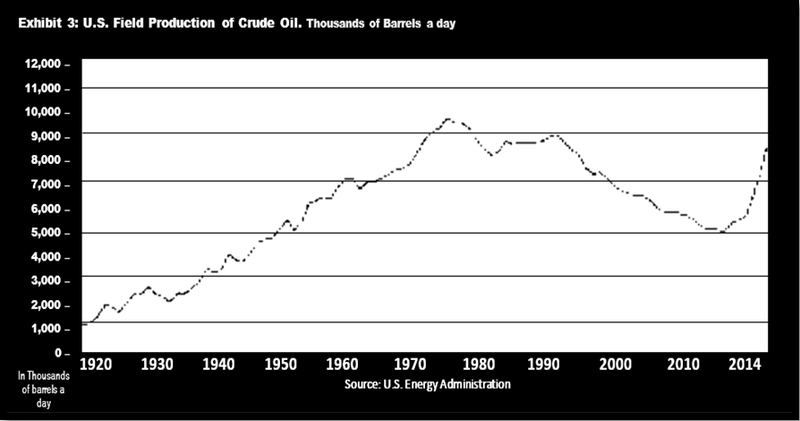 In 1969, Hubbert predicted that world oil production would peak around 2000. In fact, daily U.S. oil production did “peak” at an average of 9.6 million barrels in 1971 and then began to decline to about five million barrels in 2008. Since then U.S. oil production had not increased and in January 2015, U.S. production averaged about 9.2 million barrels per day. See Exhibit 3. Hubbert argued that oil production grows until half the recoverable resources in a field have been extracted, after which production falls off at virtually the same rate at which it expanded. This theory suggests a bell-shaped curve rising from first discovery to peak and descending to depletion. If Hubbert were right, the increase in production in the last several years should not have happened. The problem with Hubbert’s analysis and his “devotees” is that they overlooked how market prices could change the definitions of “recoverable resources” and “new reserves” of encouraging new technologies. In the current case, fracking has made once unrecoverable resources recoverable. As a consequence, U.S. petroleum production has dramatically ramped up from its low point of five million barrels per day in 2008. In the meantime, global energy prices have fallen, and many other countries are studying the U.S. example and plan to tap their own shale resources. But analysts, environmental groups, and governments are concerned about the economic costs of fracking and the risks to the environment. Hydraulic fracturing, or fracking, refers to two processes used to extract natural gas trapped in shale formations. The first step is to drill down to the sedimentary rocks, sometimes as far as ten thousand feet, then drill sideways for a mile or more. This horizontal drilling has been widely practiced since the 1980s to extract conventional oil and gas. The second is to inject water, sand and chemicals at high pressure forcing the gas to flow back out the head of the well. Future production also relates to the future price of oil. The more it costs, the more it opens up expensive oil extraction methods and far-off locations. For example, it is much more expensive to extract a barrel of oil via new deep-sea oil drilling (U.S. deep-sea producers have a break even cost of $60–$80 per barrel) or to extract a barrel out of shale oil (U.S. shale oil producers have a break even price of $60-$70 per barrel), than the traditional means available in 1956. Fracking has reinvigorated oil fields, but only at higher production costs. Also, production costs for other nations like Russia and Venezuela exceed $100, which puts them losing money until it moves up more. Lastly, pundits believe oil has no more future as energy replacements become more viable. A number of countries have quietly been acquiring gold like Russia, China, Italy and France. Foreign central banks resumed repatriating gold, with the Netherlands and Germany repatriating a total of 207 tons in 2014. The official numbers from the U.S. Federal Reserve report that only 177 tons were repatriated by other countries last year. It is uncertain what is causing the discrepancy, but it could indicate market tightness. Goldman Sachs predicts that gold production will decline going forward with the world’s gold reserves falling to zero in approximately twenty years. The reduction of new gold production could tighten the gold supply-demand balance and push gold prices up. Putin suggested Russia will go toward the gold standard in a March 2015 announcement. Fear in other parts of the world about the strength of the dollar. Most countries have been hoarding gold reserves and have been increasing their gold holdings, as mentioned in James Rickards newest book, The Death of Money: The Coming Collapse of the International Monetary System. Let’s take a look at the ten nations with the largest gold reserves, based on the latest international financial statistics and the WGC. Answer to the Question: Can we ever move back to a gold standard? Although some have speculated that we would be better off on a gold standard, the world economies would have to shrink to make that possible; and players like Japan, China and Russia just do not have enough gold to move in that direction. Over the years gold has been one of the most manipulated form of currency. FDR took it from citizens and built Fort Knox to house the hoard. Nixon used gold to leverage our position with world partners. And even though countries like China, Russia and India have increased their holdings, their gold represents only a VERY small portion of their reserves. Of the 21 thousand metric tons of gold held by the top 10 nations, the US holds about 38% of it, more than approximately the next top three countries, combined, so any move to a gold economy would help the United States, but we just don’t think it likely. We can be reached at bretmachtig.com or cagcos.com; 952-831-8243 or [email protected] or [email protected].